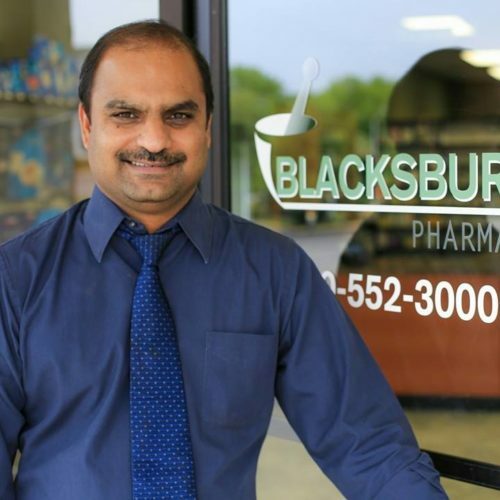 Blacksburg Pharmacy was founded by Senthil "Sen" Marimuthu. Sen moved to Blacksburg in 2004 and quickly fell in love with the college town atmosphere and strong community spirit. After over a decade of experience in retail pharmacy in Blacksburg, Sen decided the best way to serve the people of the New River Valley was to operate his own independent pharmacy. In July 2014, Blacksburg Pharmacy proudly opened its doors to the community and looks forward to continue serving you for years to come. We understand that when you or your loved ones are not well, you don't want to wait in the pharmacy for hours! Our staff fills prescriptions quickly and accurately with the help of modern pharmacy technology. Offering a wide range of pharmacy services, we cater to patient needs efficiently by preparing orders and compounding medications specialized for your health. Blacksburg Pharmacy takes pride in it's friendly and professional customer service that stands out in today's saturated market of forgettable pharmacies. We are more than a retail pharmacy! Your hometown Blacksburg Pharmacy offers a wide range of prescription and compounded medications, as well as durable medical equipment, medication therapy management, injection administration services, vaccinations, pet medications, dose packing, free local delivery, and more! Our experienced staff will provide all the information you need to make informed decisions about your health. Give us a call or stop by today!